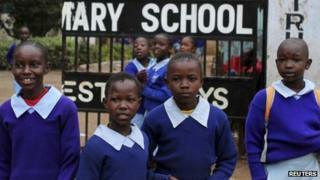 Kenyan schools have re-opened following a three-week strike by teachers after a deal was agreed to raise salaries. The government had threatened to sack them all last Friday when they rejected a pay rise offer of nearly 4%. But a deal was signed over the weekend which sees the lowest paid teacher's salary rise by 40% to about $230 (£140) a month and the highest paid to about $1,700 - an increase of 20%. Kenya's public sector has been hit by a wave of strikes this month. Doctors are still taking industrial action, and public hospitals are only taking emergency cases. Universities opened on Monday after lecturers agreed a salary deal on Friday. The BBC's Noel Mwakugu in the capital, Nairobi, says the rising cost of living and the selective approach the government has taken to award pay hikes to its workers has largely contributed to the strikes. The 200,000 teachers had been demanding a wage increase of between 100% and 300%. The agreement, signed by Kenya's Finance Minister Njeru Githae and the Kenya National Union of Teachers, also saw allowances rise for teachers in "hardship" postings - areas where there is poor infrastructure - and those working in special needs schools. End of year exams have been put back by several weeks to give students time to prepare.